We have long heard the stories about the legendary Crab Bomb served at Jerry’s Seafood. After living in the area for more than a decade and having not once been to the Lanham institution, we had to do something about it. It was time. With our friends Jim and Livya, we drove to Jerry’s last Saturday night to finally experience what some have deemed the best crab cakes in the entire DMV. Despite all the praise Jerry’s receives, you wouldn’t know it by judging from the exterior, let alone the interior of the restaurant. If you’re looking for ambiance, you best turn around. Nestled next to a liquor store and beauty supply shop, people come to Jerry’s with a purpose: to enjoy some of the best seafood inside the Beltway. While the restaurant does not take reservations, we had lucked out as several large parties left just before we arrived, so there was no wait time at all! Our friendly waitress greeted us, took our drink orders, and served us some warm, delicious rolls. Rachel and I decided to start the evening off with a bowl of their crab bisque. We knew we were in for a treat upon tasting the first spoonful of it. Simply put, it was heavenly. 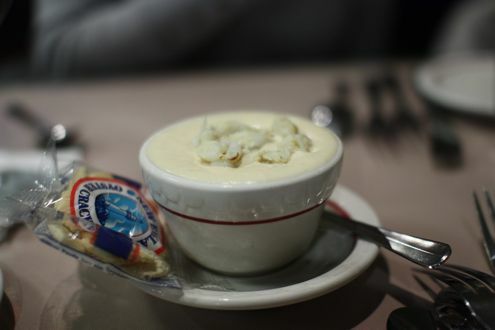 While there’s no denying the kitchen does not show restraint on the heavy cream, the intoxicating combination of crab and sherry makes it nearly impossible to put the spoon down. As for the entrees, well, that was an easy decision: CRAB BOMB! 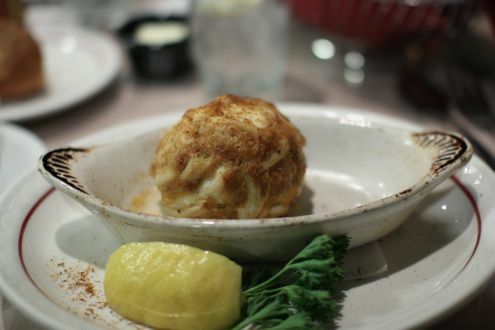 The Crab Bomb isn’t really a crab cake per se (although they do offer them on the menu), but simply ten glorious ounces of baked jumbo lump crab, Old Bay, and a smidgen of mayonnaise to hold it together. It is practically the size of a softball. A delicious, crabby softball. It’s so large in fact that they serve a smaller version appropriately dubbed the “Baby Bomb”. It’s only four ounces less than its predecessor, but just as amazing. Rachel and I each ordered a Baby Bomb and made every effort to savor each bite. It was that good. In fact, it was so good that we both deemed it the best crab we have ever had. That’s saying a lot given that we have had our fair share of crab cakes. Lightly crisp on the outside without a scratch of filler to be found inside, the Crab Bomb is worth its $34 price tag (the Baby Bomb is $26). While the price might be daunting to some, rest assured, you are getting A LOT of crab meat. It also helps that each entrée comes with two sides. Rachel went with the stewed tomatoes and a side salad while I ordered the steamed broccoli and a baked potato. Next time I’ll make sure to order a side salad as it could have been a meal in itself. The stewed tomatoes were a nice change of pace from what other seafood restaurants traditionally offer while the broccoli, lightly coated with butter, was fine. The baked potato was a bit too dry but given how the Baby Bomb overshadowed everything else, I didn’t seem to mind. Jerry’s certainly lived up to its billing on Saturday. The crab was to die for while the service was fantastic. 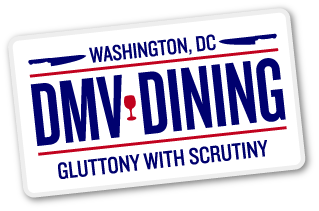 While it may not be in DC, trust us, it is worth the trip. We cannot wait to go back.